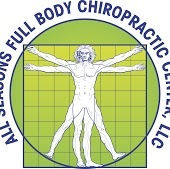 How Can I Go All Seasons Full Body Chiropractic Center, LLC? Where is All Seasons Full Body Chiropractic Center, LLC in Fargo on the Map? I love going to Dr Paul...I've gone to a few other chiropractors in the F/M area and they all seem to keep doing the same thing over and over again and that wasn't the type of experince I was expecting. On my very first visit over a year ago he explained to me the way everything in your body worked and why he does things the way he does. For the first time I actually felt like I got something out of my appointment. He doesn't focus on just one area but you're whole body every time and it's awesome. Definitely recommend him! Dr. Bekkum is a gifted chiropractor. He has helped me recover from many injuries. From shoulder dislocations to neck and back pain. I would recommend him to anyone who suffers from any sort of joint or muscle pain. Very skilled and knowledgeable with an outstanding facility. Dr. Bekkum is the best chiropractor I've been to. He has a complete approach to the problem that addresses the root of the problem rather than just doing an adjustment. He uses state of the art techniques and keeps up on all of the new research and trends. In addition, Dr. Bekkum's goal is to get you healed properly and to train you on proper PT exercises to prevent reoccurrences of the issue. As an 'older' athlete who trains regularly in sports and fitness I am constantly pushing myself to my limits. Dr. Paul's knowledge in sports therapy, recovery and care has kept me going strong... and when an injury pops up, he puts me on a path to the quickest recovery possible. He has already helped my recover from some pretty serious Back, knee and hip injuries! Over the years I've been to many Chiropractors around the country and you really roll the dice on what you get when you walk into someones office... but I highly recommend Dr. Paul to everyone I see! My right shoulder has been giving me problem since high school. In the past 20 years or so, I have seen multiple doctors, chiropractors, physical therapists to see if they are able to address my shoulder pain. None of them were able to correct my shoulder weakness. Recently I injuried my right shoulder once more while weight lifting. I decided to give Dr. Bekkum a try. He was able to get my shoulder back to no pain status in a few weeks. I understand that my right shoulder will never be 100% like new; however, I sincerely appreciate Dr. Bekkum's knowledge and technique. I plan on continuing seeing him whenever I have issues with any joints on my body.